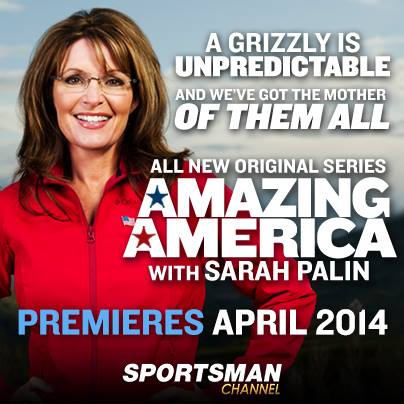 Sportsman Channel has announced that Sarah Palin will host their upcoming series “Amazing America” premiering on April 14th. Looks like Mama Grizzly has been keeping the mother of all secrets since there has not been even one tiny leak on this exciting development. Gov. Palin posted a Facebook update shortly after Sportsman Channel broke the news. It’s soon time to get your “Red, Wild and Blue” on, America! I am ecstatic to get to share more of this great country with you, and I have exciting news to share! We’ve been blessed with opportunities to travel all across America and experience inspiration! We’ve seen some wild places, met some wild people, and “amazing” is one word that comes to mind wherever the road takes us. It’s your turn to be inspired! So I am thrilled to work with Sportsman Channel on the new TV series called “Amazing America with Sarah Palin” because it lets me highlight the real stories that make America truly amazing. Let me know if I can get you any further info on this new show. We are very excited to have her on board! Thanks so much. Amazing America with Sarah Palin explores and experiences the coolest and most original people, places, businesses, and gadgets that appeal to Red, Wild and Blue America. Former Governor Sarah Palin takes viewers into the life of those living the American dream. Whether it is celebrities living the sportsman dream or equally enthusiastic everymen, Mrs. Palin will take us nationwide to find the people and places that share and reflect her passion for what makes our country amazing. The segments aren’t just about hunting, shooting and fishing, however. I’m really looking forward to this show. I predict that it’s going to be a great success for Sportsman Channel and that “Amazing America” hosted by Sarah Palin will bring a broader audience to Sportsman Channel. This entry was posted on December 10, 2013 at 7:39 AM	and is filed under Uncategorized. Tagged: 2014, Facebook, Sarah Palin, Sportsman Channel, television. You can follow any responses to this entry through the RSS 2.0 feed. You can leave a response, or trackback from your own site.